Today, I spent time with the family in downtown Chicago, visiting my wife's cousin and her husband in town from Paris. We took a water taxi down the Chicago River, stopping at the La Salle Street bridge. I noticed some news vans parked on the other side of the river and some people gathered along the riverwalk. And then I realized: it was the 100th year anniversary of the Eastland disaster. On July 24, 1915, the Eastland was loaded up with 2,500 workers from Western Electric Company and their families, ready for a picnic. After it was loaded, the boat started to list and then flipped onto its side in the river, pinning people under the weight of the vessel in 20 feet of water and trapping hundreds in the hull. In the end, 844 people lost their lives, the majority under the age of 23. Makeshift morgues were established all over the city, including the building that until recently housed Oprah's Harpo Studios. The last known survivor of the Eastland disaster, Marion Eichholz, died in 2014 at the age of 102. It remains the worst maritime disaster in Great Lakes history. The Eastland on its side in the Chicago River. July 24, 1915. Some imagery in his dreams was nonsense; probably like most people’s, he reckoned. But here and there he would have terrifyingly real dreams. Dreams that would hint at a truth yet to come. Sometimes they were cryptic. Sometimes urgent and very real. Two years ago, for example, he woke up in a cold sweat, a cacophony of screams still ringing in his ears. He had seen water and bodies. Children trapped in dark spaces, gasping for air that was non existent; hands clawing on walls; bubbles and rushes of dark, brown water; the swirling hair and vacant eyes of a woman floating angelic-like in water, eclipsing the shimmering light from above. That was it. He didn’t know if it was some horrible accident yet to come or another torpedoed luxury liner in the war. All he knew was that something horrible was going to happen and there was nothing he could do about it. That was the worst of it---the feeling of helplessness in his gut. People were going to die, and there was nothing he could do because he never knew when or where. He always lacked details. He had only been working at his uncle’s piano factory for a couple of months in 1915 when the alarms were raised in the city. The shop was located on Wabash Avenue, just a few blocks south of the river. His workday was only a half hour old and he was sweeping sawdust on the floor of the sanding and planing room when it happened. And he knew. That same feeling he had when he awoke a couple of nights earlier found itself again in the pit of his gut. 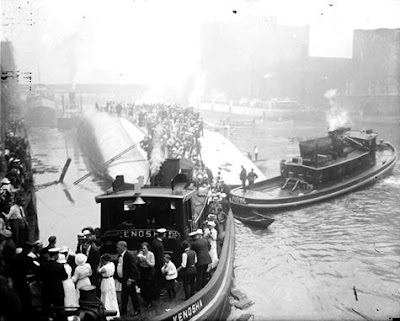 The Eastland was packed with people headed for a company picnic in Indiana when it capsized in the river, still tethered to the dock. It was top-heavy, loaded with workers and their families. Close to 850 people died that day and, although he didn’t necessarily know specifics, Robert knew it was going to happen. He ran down to the river when he heard someone on the street outside of the shop yell about the capsized boat. People crowded along the river, trying to get a view of the helpless ship. It lay on its side in the water, survivors standing on its exposed hull while arms and legs flailed in the rivery froth along the edges of the vessel. A few spectators even jumped in to try and pull to safety some of those who were exhausted and struggling to swim, their clothes heavy with the weight of water. A small, six year old boy was a lone passenger of a lifeboat, floating listlessly among bodies. The Eastland disaster proved to Robert that some of his dreams carry a heavy weight. But it is a reoccurring dream about the Great War that will change his life and all of those he knows. Lilac Wine is a novel in progress. 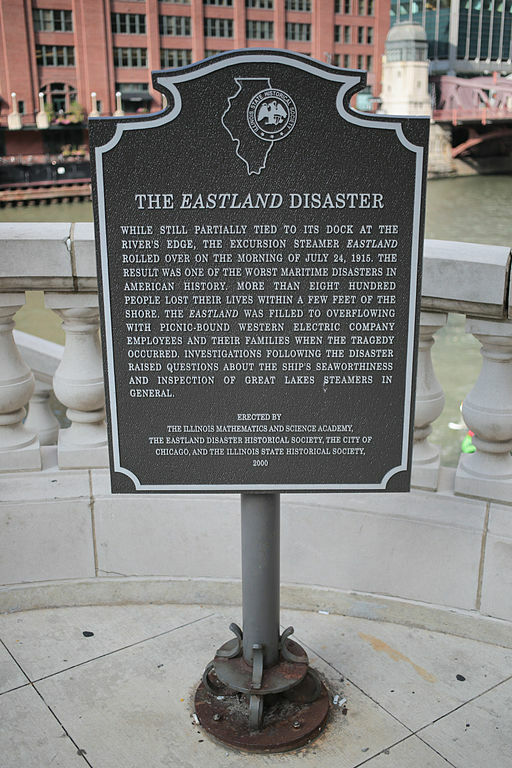 For more information about the Eastland disaster, visit The Eastland Disaster Historical Society. Abelia Brody was a loner. No one in the small, Midwestern town of Lily Springs counted her as a friend. She kept to herself mostly, tending to her garden and fermenting her wine. The summer of 1917 began like any other. But things would be different. Not only did the United States declare war on Germany, it was the summer Robert Bishop came to town. Lilac Wine is a novel in progress and is also being presented as a podcast. Bruce David Janu's first documentary, Facing Sudan, hit the festival circuit in 2007, winning two best documentary awards. In 2008, he released a follow-up,Crayons and Paper. Both films are available for streaming on Amazon Prime and for download at Bell, Book and Camera Productions. Currently, he is working on his first novel, Lilac Wine and hosts an internet radio station called Vinyl Voyage Radio. He also hosts a weekly show dedicated to Frank Sinatra called The FS Detention Club. Bruce is a teacher by trade and lives outside of Chicago with his wife and two boys.